Outside my window... the sun has risen and the sky is that not-too-ambitious pale December blue. It promises seasonal temperatures minus the biting winds. I am thinking... about a quote I found recently by William Blake -- In seed time learn, in harvest teach, in winter enjoy. I think that might be something to ponder a bit. Question of the day... do I know what season my heart is in at present? I like to use the garden's seasons as a metaphor, e.g. new life in Spring, growth and bloom in Summer, harvest for labours in Autumn, rest and hibernation in Winter. 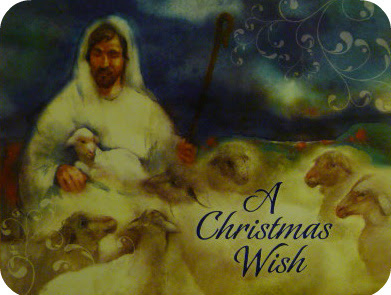 I am thankful... for the box of Christmas cards I found with this particular painting in its collection (below). I can easily imagine that I'm the one sitting so contentedly on the Shepherd's lap. from Daymaker Inspirational Gifts, Barbour Publishing Inc.
From the learning rooms... I'm taking a night class right entitled 'transform your life, transform your city'. In the kitchen... we just had freshly brewed coffee (from Panama beans) and a toasted raisin-cinnamon bagel a-drip with melted peanut butter. Yum! I am wearing... a black legging with a lacy spaghetti-strap top (still in my jammies). I am going... shopping with hubby for a new winter jacket. He wants to be sure I'll be warm when the temperatures plummet. I hope I can find both warm and pretty in the same jacket. And although I like the warmth of down, usually I feel too much like a Mrs. Waddle Downy Duck when I put on such a jacket. I started reading... Jan Karon's Shepherds Abiding. Perfect for this season. Just cracked open the covers late last night to catch a few moments in Mitford before heading off into la-la land. I am looking forward to... the weekend. We have a Christmas choral concert on Sunday afternoon. They usually give opportunity for the audience to join in a couple of rousing carols at the end. That is always one of my favorite things to do -- to sing the old familiar carols simply and sweetly. I am hearing... my computer humming. No birds around yet. No music on, Christmas or otherwise. Around the house... I came in last night from my class. It was cold and dark outside (except for the shimmer of the moon way, way up). 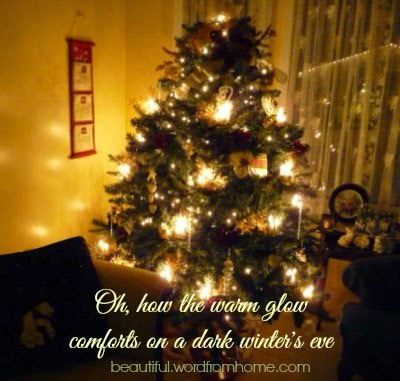 Hubby had already gone to bed, but he left the Christmas tree candle-lights on, and when I walked in I felt a rush of joy... for they offered such a warm welcome. Wishing you a beautiful day and a wonderful weekend! Lovely post, Brenda. I hope your day continues to be filled with beauty. So many lovely things to comment on. The Christmas card is so warm and inviting. I, too, get a rush of joy when I see my lit-up Christmas tree. And I hope you can find a warm, pretty coat. I always love wool, but that may not be warm enough for you. Blessings on your shopping trip. Have a marvelous day! We have a pale blue sky with tufts of white! The ground is frozen and muddy, depending on where one stands! I am gettng ready to decorate! I can't wait! Wishing you a lovely day, Brenda. Hope you find the perfect jacket to keep you warm and feeling pretty. It's sunshiney bright here today - nothing beats the blue of a prairie sky in winter. Your day sounds delightful. I hope that you found your warm, winter jacket, too. I loved this cozy post! Makes me want to tag along with you and look over your should as you read Shepherds Abiding. Such a nice format, this Simple Woman's Daybook. I think I might do it too! This post was so beautifully written. It seems like you like Christmas as much as I do! Thanks for sharing!